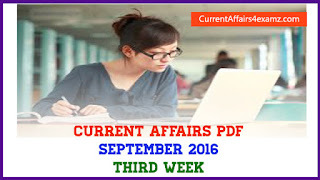 Hi Aspirants, here is the Current Affairs Quiz for 3 September 2016 with multiple choice options. Click the Start Quiz button to attempt the quiz online with options. Just login using your facebook account. You can check your score in real time. We have also compiled the Q&A for easy studying. 1. 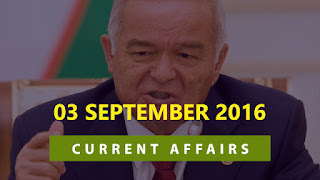 Islam Karimov who died on 3 September 2016 was the President of which country? 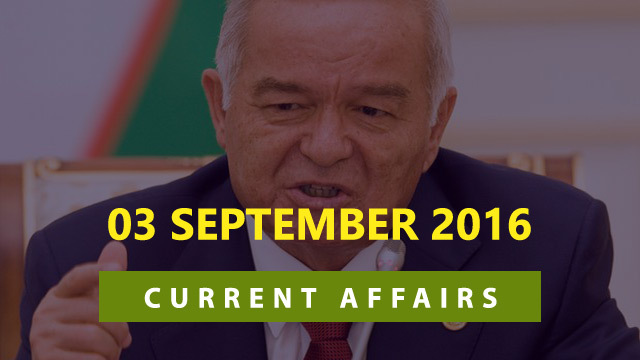 Note: He has been Uzbekistan’s sole leader since the collapse of the Soviet Union in 1992 & winning numerous elections, none of which have fulfilled international fairness criteria. 2. The first BRICS Film Festival kick started on 2 September 2016 in which city? Note: Minister of State for Information and Broadcasting Rajyavardhan Singh Rathore inaugurated the festival. The opening film for the festival was the world premiere of the Malayalam movie, Veeram. 3. Election Commission of India (ECI) has recently granted national party status to All India Trinamool Congress (TMC) Party led by West Bengal Chief Minister Mamata Banerjee. With this recognition, TMC became ___ national party in the country? Note: The other national parties are Bharatiya Janata Party (BJP), Congress, Bahujan Samaj Party (BSP), Nationalist Congress Party (NCP), Communist Party of India (CPI) and Communist Party of India-Marxist (CPM). 4. CMD of biopharma Biocon, Kiran Mazumdar Shaw was given the ‘Chevalier de l’Ordre National de la Légion d’Honneur’ award. It is the highest civilian award of which country? Note: She was awarded for her contribution to biosciences & research field globally. 5. Name the Political Party launched by Cricketer-turned-politician Navjot Singh Sidhu on 3 September 2016? Note: He launched the party along with Akali Dal MLA Pargat Singh and some other leaders. Sidhu had resigned in July from his Rajya Sabha seat from BJP ticket. 6. Which former Indian cricketer was recently (September 2016) made an honorary life member of the Marylebone Cricket Club (MCC)? Note: He becomes the 24th Indian cricketer to be bestowed the honour. The list also includes the likes of Sunil Gavaskar and Sachin Tendulkar, who were inducted in previous years. 7. Which Digital payments platform has recently launched “M-Gullak” to promote the habit of savings? 8. Which country's Province named British Columbia has recently become the first foreign government entity to issue a masala bond? Note: Masala Bonds are rupee-denominated bonds issued to overseas buyers, aimed at investments into India’s infra needs. In July, HDFC had listed the world’s first masala bond, raising Rs. 3,000 crore. 9. Name the Action movie star, writer, director who was recently (Sept-2016) given an honorary Oscar for his extraordinary achievements in the movies? 10. India has been placed at the ___ rank in the World Bank’s 2016 Logistics Performance Index (LPI) among 160 countries?